I was never a watch guy. Actually, let me rephrase -- I was never a watch guy until I bought a Tissot online for giggles (and about $350). That day sort of changed the way I looked at these seemingly archaic wrist appliances. They become a statement about you. They can make you feel awesome. And, perhaps most importantly to Apple, they can stop being a thing you wear and become something you don't want to take on your day without. With all that said, and given my general lack of expertise in horology, I did the only sensible thing I could. 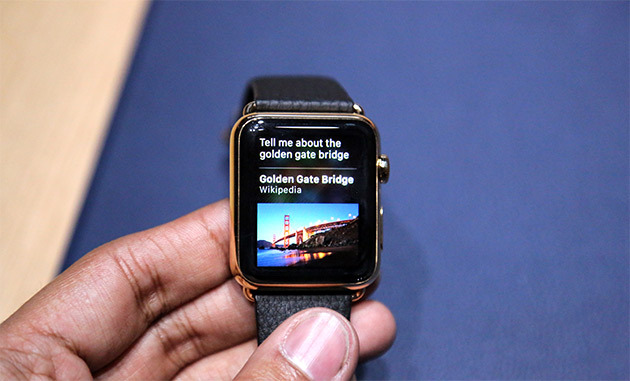 I strapped on the $12,000, yellow gold Apple Watch Edition in an incredibly dark room and took it for a spin. A brief aside: Yes, $12,000. That's how much Apple is asking for the 42mm Apple Watch Edition, and it's a princely sum no matter how you slice it. Thankfully, you'll be able to buy a Sport model for as little as $349... if you don't mind the utilitarian feel, anyway. Despite the differences in materials, all three versions of the Apple Watch feel very similar once you've got 'em strapped on. The 42mm versions are just a touch more substantial thanks to the slightly bigger chassis and battery (I'm told the difference in battery life is super small), but you're not going to notice the difference. My go-to watch is a stainless steel Mondaine and the Watch felt dramatically heftier, only natural considering all the stuff that's been crammed into it -- it's also got more weight to it than an ASUS ZenWatch, the Android Wear watch that Apple's work most closely resembles. Don't worry: You might not love the shape, but the Watch feels suitably expensive. Let's take a moment to dissect how you're actually going to interact with this thing. I was a little concerned about the digital crown at first, given how integral it is to actually using the watch -- you'll press it to view that constellation of apps, turn it to zoom in and out and double-tap it to bring up your watch face. It'll sound minor, but there's plenty of resistance to be felt as you start turning it, and that helps make the whole thing feel a little more measured and (dare I say) premium. You'll be doing quite a lot of force touching as well, which works exactly the way it sounds -- pressing down and holding lets you swap through the 10 available watch faces. Let's be honest here: I'm not entirely sure what force touching brings to the table that a standard long press doesn't. Apple just might be trying to save us all fractions of seconds of interaction so we can go back to our lives as quickly as possible, but I'm not convinced yet. Here's the other thing. There's no denying that the Watch is elegant in its design and occasionally in its modes of interaction, but it's just not as immediately easy to wrap your head around as an iPhone is. If you're anything like me, you'll occasionally find yourself pausing from time to time, wondering if you're supposed to depress the crown or tap the Home-like button below to get where you're going next. It's a good thing, then, that Apple's planning a very hands-on approach to walking people the trying-and-buying process. You'll probably need it. Moving on. Obviously, the software's still not ready for public consumption -- Apple staffers seemed to cycle through two demo Siri questions ad infinitum -- but interacting with the Watch does seem more thoughtful and elegant than earlier reports might've suggested. What seems most immediately useful are the Glances, little applets that are invoked when you swipe up from the bottom of the screen. Need to check stocks? Toggle Bluetooth? You'll be able to do that without having to dive into your app galaxy -- just swipe up and take a gander. Meanwhile, smart approaches to third-party apps like WeChat and Uber only extend the value of a device that plenty of people would've kneejerk-bought anyway. As I noted during our liveblog, Tim Cook made several attempts to frame the Watch not as a gadget, but as a companion. It'll remind you "like a friend does." It's like having a "coach on your wrist." I've admittedly only spent maybe 20 minutes with the Watch lashed to my wrist, and I spent that entire time waiting to be struck with a flash of inspiration along the lines of what Cook envisioned. "Oh," I thought I'd say. "That's why it'll be worth buying one of these things." The epiphany I was half-hoping for never materialized... but that's not to say it won't. Apple's Watch is ambitious in a way that few devices are, and its true value (which I suspect will come in the form of dev support) isn't obvious to me just yet.